This isn’t the first book that I’ve read by McCarthy. I read The Road a few months ago and so I knew that I had to prepare myself when sitting down to begin All the Pretty Horses. If you have ever read a book by Cormac McCarthy, then you will understand that his writing is unique and often very depressing. All the Pretty Horses is no exception. It is a book about love and friendship and although not quiet as desperate or bleak as The Road, it sure has its moments. Our protagonist is a sixteen year old of few words, who spends most of his time among the horses, whispering to them, calming them and of course riding them. A world without horses to John Cole Grady is unimaginable, which is why, when his mother tells him that their ranch is being closed, he decides to set out on horseback with is friend Lacey Rawlins, to find work in Mexico. Leaving their childhoods behind them in San Angelo, Texas, they travel towards the border and a time of their lives that will scar them forever. On the way, they meet a younger, runaway boy, Blevins, on a distinctive and grand horse. Rawlins isn’t pleased to take in the boy, but persuaded by John Grady, he gives in and lets Blevins and his horse tag along for the ride. During a large storm, Blevins loses his horse, and that’s when the trouble begins. In Mexico, John Grady finds love, learns the true meaning of friendship and ends up out of his depth and in danger when the authorities start asking awkward questions. I have to say, it took me a while to get into this book as McCarthy’s style is at times challenging, but once accustomed to his lack of punctuation, I found myself completely absorbed with John Grady’s journey through the unforgiving, barren lands of Mexico. The language complements the scenery perfectly, and adds to the desolate and often dispiriting storyline. 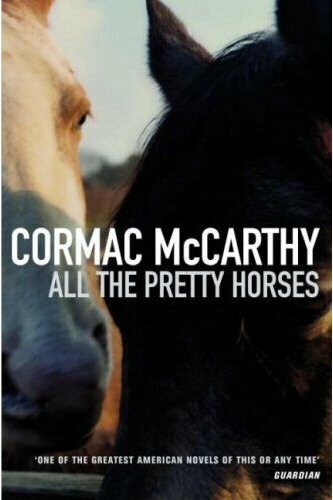 All the Pretty Horses isn’t a book to read lightly, it needs concentration. But it is not a tale that you will forget easily and unlike The Road, when closing the last page, you will be left with a lingering feeling of hope. If you are a McCarthy fan, you can buy the book by clicking the picture below. Hey thanks for the visit at the Cafe! I love your book reviews, as I’m a book lover and sometimes I’m just left with decision paralysis about what to buy. I’ll be dropping by for suggestions. Thanks. Thanks! And feel free to recommend any books you think I’d like as well, I have the same trouble! I’m glad to see McCarthy getting good reviews. I’ve found that my recommendations of his work aren’t usually well received. If you enjoyed All the Pretty Horses, the rest of The Border Trilogy is well worth your time and emotional investment. Keep at it, bookworm. Thanks! I will definitely being seeking out more of his books…I might leave it for a few weeks though – not sure I can manage to McCarthy books in a row! Isn’t that the first of the Border Trilogy? I’ve read a few of his other works and have been meaning to dig into these. The first thing I ever read by him blew my mind. It was a book called Child of God. I was appalled, shocked, and riveted. Absolutely fantastic. If I am not mistaken, he was a student of William Faulkner’s. He, like Faulkner, Flannery O’Connor, and Carson McCullers make up some of the building blocks of Southern Gothic literature. That reminds me, McCullers’ The Heart is a Lonely Hunter is absolutely fantastic. Great movie too. I’d love to read your review! Yeah, it’s part of the Border Trilogy. I’m planning on slowly making my way through the rest of McCarthy’s book, but I do have to take a break and read something more light-hearted in between. I’ll have to check out the other authors you’ve mentioned too!